We are excited to announce that in our continued push to help Creators monetize their links we’ve recently launched support for the B&H Photo Video affiliate program. 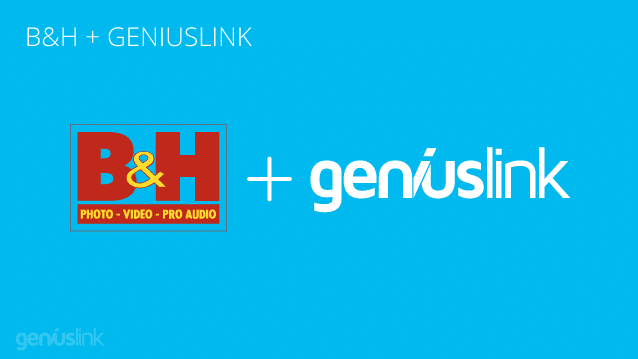 Geniuslink clients can now more easily create and manage B&H affiliate links. This new functionality creates even more opportunities for your links to work harder and smarter for you. B&H Photo Video is well known across the YouTube, podcasting and Creator communities as the go-to store for professional equipment and technology. With a deep background in photography and retail (they first opened in 1973) they have expanded past photography, video and audio to also carry a deep inventory of computers, peripherals and a wide range of consumer electronics (they carry over 500,000 products in stock). For me, one of the things that helps set B&H apart is their focus on “people, not algorithms”, their customer service and deep knowledge about the products they sell. The B&H website is currently ranked in the top 500 websites in the US, top 1500 worldwide and 14th in Consumer Electronics shopping according to SimilarWeb. And most importantly, B&H also happen to have a well-managed affiliate program which many consider a great alternative to the Amazon affiliate program. In our attempt last year to quantify the affiliate landscape we saw it was the 20th largest affiliate program with approximately 2,000 affiliate sites as recognized by PublicWWW. The B&H Photo Video affiliate program pays commissions from 2 to 8% (based on performance) with an average of 3.5%* and a cookie length of 60 hours. In comparison to Amazon’s affiliate program, the commissions are 2% on TVs, 2.5% on PCs and components and 4% on most everything else with a cookie window of only 24 hours. The average earnings per click with the B&H affiliate program is between $0.17** to $0.22* which is 3X to 4X higher than what we typically see with Amazon Associates program of $0.05. Unlike Amazon, Walmart, iTunes and Microsoft, B&H has just a single storefront they use to service a global population with shipping to approximately 160 countries (there are only six countries they don’t ship to). Their site supports both English and Spanish and 20 different currencies making it an easy destination for international traffic. Most importantly, with a single storefront and affiliate program, the complexities of providing a good user experience and monetizing your foreign visitors are eliminated. B&H is also an interesting alternative to Amazon’s Associates program as it allows links to be placed in “offline” places such as email, PDFs, and ebooks. Additionally, while a consumer’s trust in your links is always very important, B&H also doesn’t have the requirement of having a mention of the store in close proximity. These are both things that Amazon’s affiliate operating agreement bans. Similar to their store, the affiliate program also focuses on customer support and has dedicated campaign managers (shout out to ours, the fabulous Izzy Flamm!). The B&H affiliate team also works closely with Creators to help educate their audience about products by offering a “Loaner” program for equipment as well as sending a daily email of the just announced and brand new products. While we love the B&H affiliate program, the affiliate network they run on isn’t as new and shiny as some of the others. Additionally, the link format necessary for proper attribution tracking can be a bit tricky. This challenges can make generating an affiliate link for the B&H program a bit of a task. Unfortunately, it’s not as easy navigating to the product you want to promote on their site and adding a tracking parameter to the end of the link. We’ve been working with B&H for over a year now to make the process of affiliating a link from their website as simple as can be and are excited by what we can now offer you. 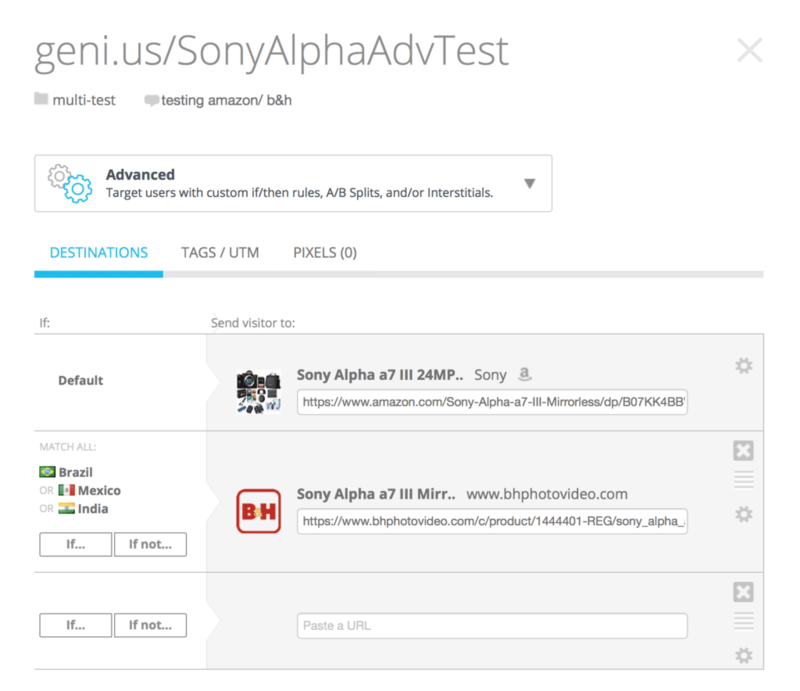 Any B&H product link can now be used in a Geniuslink and you can rest assured that all clicks on it will be sent to the correct destination with a properly formatted affiliate tracking link. We call this process “Auto affiliation” and it’s very simple to set up. You simply need to grab your KBID from your approval email or their affiliate dashboard and drop it into Geniuslink. Once we have your ID all of your geni.us links for B&H will start using the tracking info appropriate for your affiliate account. Additional information on adding your B&H affiliate information into your Geniuslink account can be found in our Knowledge Base. Please note that with our recent rollout of VigLink and Skimlinks support you can also monetize your B&H links through either of these monetization platforms. While there are some strong benefits of using VigLink or Skimlinks the biggest benefit of signing up directly and adding your KBID directly into Geniuslink is that you’ll keep 100% of your commissions earned from the program (vs. the ~ 75% that is paid out when using an affiliate aggregator). 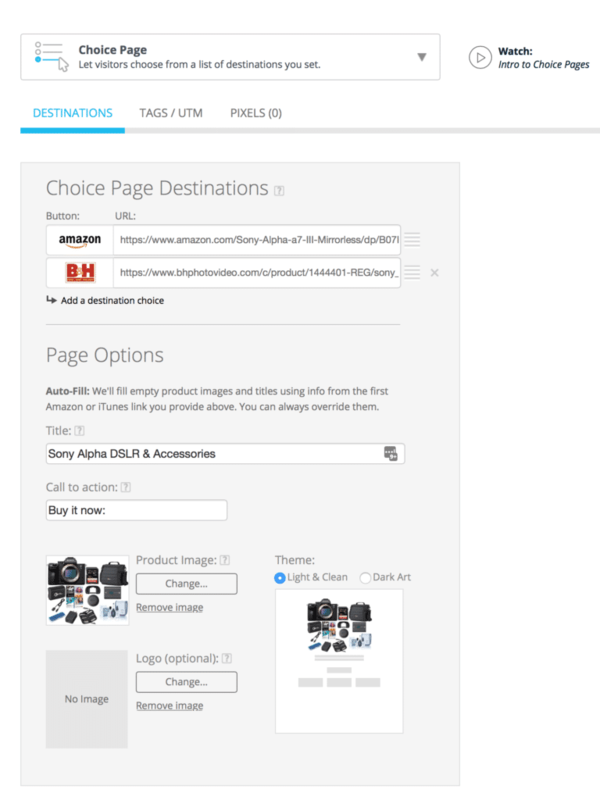 As the Geniuslink platform is open-ended, and you can use a B&H link however you see fit, we have a few suggestions if you are up for a challenge and want to experiment with augmenting your Amazon affiliate links. 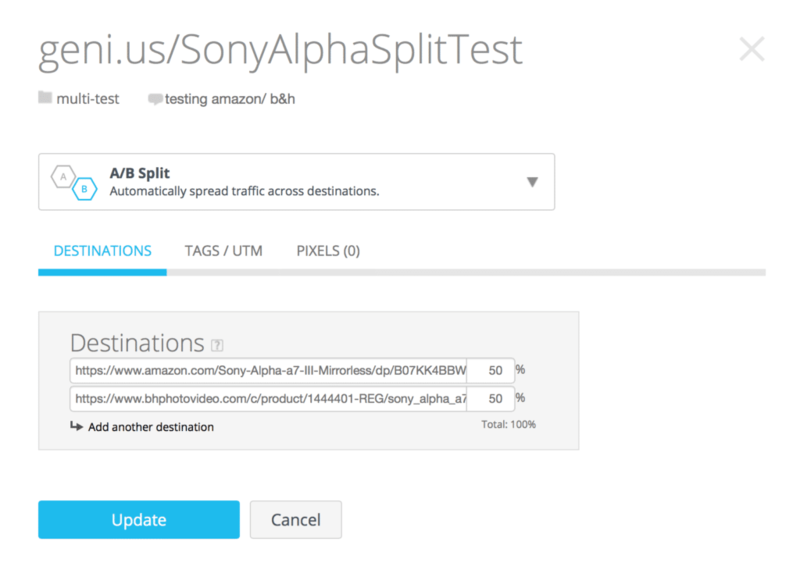 A/B Split Links – While the Amazon.com Associates program is often a mainstay way to earn commissions from US-based clicks we’d encourage you to test if its the best buying option for your traffic and the products you are recommending. Our A/B Split Test links provide a way to closely track conversion rates and earnings between two or more affiliate programs. Choice Pages – If you’d rather not commit to a single destination, or want to be burdened with testing the performance of your links, and follow our theory that curation and choice is good for the consumer then we’d encourage you to create a Choice Page to promote a product where you’ll have Amazon and B&H buy buttons sitting side by side (eg. https://geni.us/SonyAlphaChoicePage). You can then provide consumers with options and monetize the sale either way. We bet you’ll see a boost in overall conversions and total commissions. More info on how to set up a Choice Page can be found in our Knowledge Base. Advanced Links – While a geni.us link for Amazon is automatically localized world-wide you may find you want to use B&H for specific locations where you haven’t been approved for Amazon’s regional affiliate programs. Pointing your clicks from Mexico, Brazil and India to B&H might help you still capture revenue from the clicks you were previously missing out on. Use B&H links to capture commissions from countries where you aren’t approved for Amazon’s regional affiliate program. While every website, YouTube channel, community and audience is different and the products you are promoting, and how you do so varies you might find that while Amazon provides a great affiliate program it might not be perfect for you. The B&H store and affiliate programs are great options to explore, especially with consumer electronics, photo and video gear, and computers. We are excited to hear if you see higher returns using an alternative retailer and affiliate program. In the last few weeks we’ve rolled out support for monetizing your links in a number of ways with the launch of direct auto affiliation for B&H, as well as Walmart.com, and tens of thousands of other affiliate programs from integrations with both VigLink and Skimlinks we are just getting started. We look forward to hearing your feedback.